If you visit St Pancras tomorrow morning, cast your eye over the departure boards. For at 07.19 tomorrow morning something remarkable will happen. The first ever scheduled passenger train will leave London for the shores of the Mediterranean: the direct Eurostar service to Marseille. London's St Pancras station is always worth a visit. It's often at its best on a spring morning when the sun streams through the latticework windows above the main concourse to create a tantalising web of light and shadows. If you happen to be at St Pancras tomorrow — on the morning of May Day — then just after seven is the time to get the best light effects. 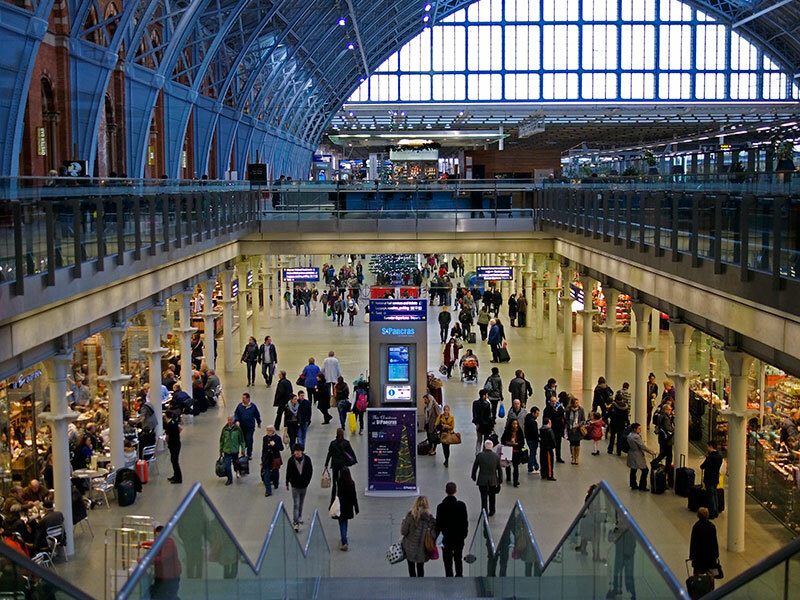 If you visit St Pancras tomorrow morning, cast your eye over the departure boards. There is a train due out at 07.18 to Bedford and another at 07.20 to Sutton — neither of these services is grand enough to deserve a space in the quiet grandeur of the classic concourse. No, these local trains will both leave from the subterranean platforms. But tomorrow is a day to skip the nether regions of St Pancras and focus on the main concourse. For at 07.19 tomorrow morning something remarkable will happen. The first ever scheduled passenger train will leave London for the shores of the Mediterranean. Eurostar has long had a seasonal service to Avignon. In spring 2013 the company operated an experimental service to Aix-en-Provence, though that was very limited. Just nine trains ran in 2013 from London to Aix and back. Avignon and Aix, though both in Provence, are inland cities - not quite on the Med. Tomorrow Eurostar launches its new year-round service from London to Marseille. At 1239 kilometres, the route is the longest ever served by any scheduled passenger train from Britain. A first in railway history. The previous record was held by the 2013 service to Aix-en-Provence. Along the way the train from London to Marseille will make four scheduled intermediate stops. The first is at Ashford International to pick up passengers bound for France and the second at Lille Europe for a crew change where an SNCF driver will take over the train for the high-speed run south through France. Passengers can alight from this new service at Lyon Part-Dieu and Avignon TGV stations - and of course at the train's final destination at Marseille St-Charles. From the latter station, it is just a short stroll through the Quartier Belsunce to the port district. It has of course long been possible to travel by train from London to Marseille - but until now it was always necessary to change trains along the way. Cast back 50 years and affluent travellers could board the Night Ferry train at London Victoria in the evening, and travel in a sleeping car all the way to Paris. The sleeping cars were transported on a ferry from Dover to Dunkerque. Arrival in Paris was in good time to allow a connection onto the lunchtime express to Marseille. This first-class-only train was called Le Mistral, and it positively breezed down the Rhône Valley, taking just over seven hours for the journey from Paris to Marseille. That 1965 journey using the Night Ferry and Le Mistral from London to Marseille took 22 hours. The one-way fare for the journey, calculated in terms of today's monetary value, was about 400 pounds sterling. The new Eurostar service from London to Marseille takes 6 hrs 27 mins. Single fares start at under 50 pounds. The London-Marseille service will run thrice-weekly from tomorrow, ramping up to five times per week in each direction from 5 July.